When a tooth is lost, the jawbone beneath it begins to shrink (or atrophy) and becomes brittle from lack of exercise. Not only does losing a tooth affect your smile, it also changes the shape of your face, making you to look prematurely aged. Dental implants are the new standard of care for tooth replacement. Dental implants are a safe, esthetic alternative to traditional crowns, bridgework, and dentures. Because implant restorations look and feel more like natural teeth, they offer new levels of comfort, security and confidence over traditional treatments. A dental implant is a small “anchor” made of titanium that is inserted into the jawbone to take the place of your missing tooth root. A replacement tooth is secured to the top of the implant. This new tooth looks, feels and performs similar to your natural teeth. Maintain anatomy. If you have missing teeth, the bone begins to shrink over time. 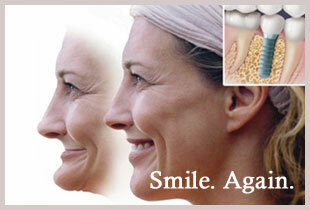 Unhealthy bone loss can make your jaw line recede and change your facial structure. Dental implants can help prevent deterioration of the jawbone so your face retains its natural shape. Keep your healthy teeth. A better long-term alternative to bridgework, dental implants eliminate the need to grind down healthy teeth when replacing one or more adjacent teeth. Your own natural healthy teeth are not compromised. Security. Securely anchored dental implants do not slip or move. This eliminates some of the key problems of dentures, including poor fit, gum irritation and pain. The result is superior comfort, reliability, and freedom from embarrassment. Learn more about Dental Implants in Brookline MA. Schedule a consultation appointment with Dr. Lipetsker to discuss whether Dental Implants are right for you.